Red sandy loam, laterite and alluvial soils are suitable. Select sites with deep (not less than 1.5 m depth) well drained soil heavy, imperfectly drained soil is unsuitable. Avoid shallow soils with underlying hard rock, low-lying areas subject to water stagnation and heavy clayey soils. Soil with a minimum depth of 1.2 m and fairly good water holding capacity is preferred for coconut cultivation. However, in lands, reclaimed by heaping alternate layers of sand and clay, coconut thrives well. Proper supply of moisture either through well distributed rainfall or irrigation and sufficient drainage are essential for coconut. Coconut can be grown in soil with pH of 5.2 – 8.6. The nature of preparation of land before planting depends upon topography of land, soil type and other environmental factors. The area should be cleaned and planting holes marked out at appropriate places. If the land is slopy, soil conservation methods should be adopted. If the groundwater level is high planting may be taken up in the mounds. On slopes and in areas of undulating terrain, prepare the land by contour terracing or bunding. In low-lying areas and rice fields, form mounds to a height of at least 1 m above water level. In reclaimed kayal areas, planting can be done on the field bunds. Although several systems of planting are followed, selection of a suitable system depending on soil, climate, plant type etc. Adoption of improper system results in over lapping of plant parts, competition for water, light, nutrient and unequal distribution of water etc., ultimately results I poor performance. The systems of layout are Square system, Rectangular system, Triangular system, Hedge system and Contour system. These are all systems are followed in Tamil Nadu, Kerala and Karnataka state. Formulate for calculating number of plants per unit area in different systems of layout. (i). Tamil Nadu: Adopt a spacing of 25' x 25' (7.5 x 7.5 m) with 175 plants/ha is ideal for tall varieties and a spacing of 8.5 x 8.5 m is optimum for hybrids. A spacing of 6.5 x 6.5 m is optimum for dwarf variety. For planting in field border as a single row, adopt 20' spacing between plants. Tamil Nadu: Dig pit size of 3' x 3' x 3'. Fill the pit to a height of two feet (60 cm) with FYM, red earth and sand mixed in equal proportions. At the center of the pit, remove the soil mixture and plant the seedling after removing all the roots. Press the soil well around the seedling and provide the seedling with shade by using plaited coconut leaves or palmyrah leaves. Keep the pits free from weeds. Remove soil covering the collar region. As the seedlings grow and form stem, fill up the pits gradually by cutting the sides. Kerala: The size of pits for planting would depend upon soil types and water table. In loamy soils with low water table, pit size of 1 x 1 x 1 m is recommended. In laterite soils with underlying rock, take larger pits of size 1.2 x 1.2 x 1.2 m. In sandy soils, the size of pits may be 0.75x 0.75 x 0.75 m. The pits may be filled up with topsoil and powdered cow dung / compost to a height 60 cm below the ground level. Press the soil well so as to avoid water stagnation .In low lying lands, take shallow pits and as the plant grows, raise the ground level by adding silt and sand so as to cover the entire bole of the palm. However, when the water table is high, planting at the surface or even on mounds may be necessary. Burial of two layers of husks in the floor of the pits will be useful for moisture conservation. The husk is to be buried in layers with concave surface facing upwards. After arranging each layer, sprinkle carbaryl 10% dust on the husk to prevent colonization by termites. Note: In lateritic areas, common salt at the rate of 2 kg per pit may be applied on the floor of the pit to improve soil conditions. Common salt is to be applied about six months prior to planting. If there is chance for white-ant attacks apply Sevidol 8 G (5gm.) inside the small pit before planting. Karnataka: Prepare the land by ploughing and harrowing. Pits of 1 m cube (3.3 ft) with proper spacing according to the variety are opened well in advanced and exposed for weathering. Fill the pits with green leaves, compost / FYM and top soil. Plant seedlings in center of the pit and press the soil firmly around the plant and provide support. Whenever it is necessary provide shade during summer. While planting, deep palcing of nut upto 45 cm is preferred. Time of Planting: Planting the seedlings during May, with the onset of pre-monsoon rains is ideal. Under assured irrigation, planting can be done during April also. In low- lying areas, plant the seedlings in September after the cessation of heavy rains. For the first two years from planting, irrigate @ 45 litres of water per seedling, once in 4 days, during dry summer months. Provide adequate shade to the transplanted seedlings. Also provide staking so that winds may not uproot the young seedlings. Provision of proper drainage is also equally important in areas subject to water logging. If planting is taken up in littoral and soil, application of 0.15 m3 of red earth is recommended. The pits should be cleared of weeds periodically. Soil washed down by the rains and covering the collar of the seedlings should also be removed. The pits should be widened every year before the application of manure. The pits should be gradually filled as the seedlings grow. The palms should be frequently examined for any insect or fungal attack and necessary remedial measures should be taken up promptly. Coconut seedlings are planted 7.5 m to 9.0 m apart and hence the wider interspace can offer opportunities for raising other crops, either annuals as intercrop or perennials as mixed crop as a source of additional income to the growers. While such inter or mixed-cropping system is adopted, about 2 m all round the basin of the palm should be left un-cropped and kept free from weeds for regular manuring and cultural operations to the main crop. Diversified multi-species cropping system will generate enough cash, food, fruit, fodder, fuel etc. when annual or seasonal crops are grown in the interspaces of coconut palms, it is designated as inter-cropping and when perennials are grown, it is called mixed-cropping. When a combination of intercrops and mixed crops are raised together, it is termed as multi-storeyed cropping. Depending on the age of the palm and canopy coverage of the ground, suitable crop combination could be selected. Tamil Nadu: Inter/mixed crops may be selected based on the climatic requirement of the inter/mixed crop, irrigation facilities and soil type. The canopy size, age and spacing of the coconut are also to be considered. Market suitability should be taken into consideration before selecting an intercrop. A. Below 7 years of age: Any suitable annual crop for particular soil type and climatic condition may be raised as intercrops upto 5 years after planting depending upon the canopy coverage. Groundnut, sesame, sunflower, tapioca, turmeric and banana can be grown. Avoid crops like paddy and sugarcane etc. B. 7 – 20 years of age: Green manure crops and fodder crops (Napier grass and guinea grass) alone can be grown. C. Above 20 years of age (20 years of age has to be adjusted based on the sunlight transmission of above 50% inside the canopy): The following crops can be grown depending on the soil and climatic suitability. (ii) Biennials: Banana varieties like Poovan and Monthan are suitable. *Suitable areas in Pollachi tract of western region and Kanyakumari district. For vanilla, use disease free planting material and maintain high vigilance to maintain a disease free crop. In all cases, separate application of adequate fertilizers and manures to the individual crop is essential. Intercrops are sown/planted in rainfed coconut garden taking advantage of the summer showers in May or during the onset of monsoon in June. When the intercrops are grown both the main crop and subsidiary intercrops should receive the recommended management practices for obtaining satisfactory yields without affecting the main coconut crop. The common annual intercrops that could be grown during the pre-bearing or early stage of growth of the palms are: dry land paddy, millets, groundnut, cowpea, chillies, wheat, potato, tuber crops and rhizomatous crops. In older plantations, mostly root and stem tuber crops such as elephant foot yam, cassava, colocasia, greater and lesser yams, sweet potato, ginger and turmeric are grown. Among these elephant foot yam is found to be the best and most profitable among the intercrops followed by ginger, cassava, turmeric, French bean fodder grass (Hybrid Napier, Guinea grass and Styloesanthes gracilis), sunflower, cowpea and ragi under rainfed conditions. Intercropping and Mixed Cropping: Schedules for inter/mixed cropping may be drawn up based on the canopy size, age and spacing of palms. In general, palms in the age group of 8-25 years are not suitable for inter and mixed cropping. However, cereals and tapioca are recommended as intercrops in young coconut plantation up to 3-4 years. Since ginger and turmeric are shade tolerant crops with shallow roots, they can be intercropped in coconut garden even in the age group of 15-25 years. It ensures better land utilization, solar energy harvesting, efficient water use, utilization of soil nutrient resources, more returns and an insurance against crop failure. Under conditions of wider spacing i.e. beyond 7.6 m, intercropping is possible irrespective of the age of the palms. In all cases, separate application of adequate fertilizes and manures to the individual crop is essential. Mixed Farming by raising fodder grasses such as Hybrid Napier or Guinea grass along with leguminous fodder crops such as Stylosanthes has been found to be profitable. 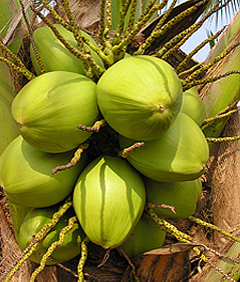 Raising the above crops in one ha of coconut garden can support three to four diary animals. The animals supply large quantities of cattle manure which when applied to the soil will improve its fertility status. This sort of mixed farming will improve the yield of the palm. The main purpose of multi-storeyed cropping is for greater utilization of the solar energy, soil moisture and nutrient resources from various depths and also air space. The rooting pattern of crop combinations should also be kept in view while selecting the individual species. In intensive study of multi-storeyed crop combinations has brought out a four-crop architecture i.e., coconut, pepper, cocoa and pineapple under irrigation. The feasibility and success of this multi-storeyed architecture depends on the crown habit of coconut spaced at 7.5 to 8.0 m apart, which form 'top floor, pepper vine trained up to 8.0m on the coconut palm trunk form the 'second floor', cocoa branch spread confined to a height of up to 3.5 m forms the 'first floor' and pineapple forms the 'ground floor', till the canopy of cocoa completely covers the interspace. The root systems of these crops were found mutually exclusive and did not overlap to any appreciable extent. The solar energy incident on the area is intercepted up to the 'ground floor'. Cocoa being a shade loving crops can grow well under coconut and the pineapple grows well under partial shade. Micro-climate like evaporation soil temperature relative humidity and atmospheric temperature are found more congenial for crop production compared to pure coconut stands. The practice of growing biennial and perennial crops like banana, papaya, pineapple, arecanut, mango, jack fruit etc., along with coconut is prevalent in the holdings of small farmers. Attempts have also been made to grow rubber in between the grown up coconut palms. In recent years, tree species like clove, nutmeg and cinnamon have been introduced and planted in the center of four coconut palms spaced 7.5 m apart. Attempts are being made to grow coffee and forest species (un-branched and quick growing type) in between coconut rows. However, the suitability/compatibility of mixed cropping system has mostly been overlooked and as a result, the competition with coconut for soil moisture during stress period, incidence of sunlight, infestation of pests and occurrence of diseases have been observed. The crops selected for mixed-cropping should preferably be shade tolerant since the incidence of sunlight would be insufficient below the coconut canopy. Among the mixed crops tested, banana is found to be the most important intercrop for coconut garden. It responds to similar irrigation and manuring systems as coconut and also comparatively free from serious pests and diseases except the burrowing nematode in certain pockets. Banana as intercrop is mostly grown under rainfed conditions. About 1000 banana plants could be raised/ha of coconut garden (125 palm/ha). Pineapple could be successfully raised as an intercrop both under rainfed and irrigated conditions. Under irrigated conditions, the size of each fruit would be about 1.5 kg; while as a rainfed crop, the size is reduced to half (0.71 kg). About 4000 kg pineapple/ha can be harvested in multi-storeyed cropping system and much more when only pineapple in grown as inter-corp.
By growing crops in between coconut palms, there would be considerably yield increase in coconut and the root system is not competitive. Thus, the combination of crops has a mutually beneficial effect and there is the profitability of the whole cropping programme. Coconut + Banana + Sirukizhangu + Bhendi is suitable system for the eastern region. Crops like banana, pepper, cocoa, nutmeg, vanilla can be tried under multiple cropping systems in suitable areas in the western region. In all the systems, apply recommended quantity of water and manures and fertilizers to the intercrops separately. (a) Kharif: Rice, Maize, Groundnut, Ginger, Tturmeric, Chilli, Yams, Colocasia, Red gram, Vegetables, Sweet potato, Tapioca, Banana, Pineapple, Papaya and Fodder grass. In older plantation cocoa, cinnamon, pepper, clove, nutmeg etc. can be grown as mixed crops. However, these inter/mixed crops are to be adequately and separately manured in addition to the manures applied to the coconut palm. (a) Green manure crops: Crotalaria juncea (sunn hemp), Tephrosia purpurea (kolinji), Gliricidia maculata Indigofera hirsuta, Pueraria phaseoloides. Weeding and Interculture: Keep the pits free of weeds by periodical weeding. Remove the soil covering the collar of seedlings. As the seedlings grow and form stem, fill up the pits gradually by cutting the sides. Proper intercultivation provides control of weeds and creates soil mulch. Any tillage system (ploughing, digging, raking or forming mounds) that provides soil mulch and control weeds may be followed depending upon local conditions. The inter-space in the coconut garden has to be ploughed twice in a year in June - July and December - January For laterite, sandy and red sandy loam soils give two ploughing or diggings in May-June and September-October and one raking in January. In areas where surface run off is more, form mounds in September-October and level them in November-December. For the broad-leaved weeds, pre-emergence spraying of atrazine @1.0 kg a.i./ ha for the control of grasses and sedges. Post emergence spraying of glyphosate @ 10 ml and 20 g ammonium Sulphate /litre of water. Replanting or Under Planting: Replanting or under planting becomes necessary when the yield is very low due to old age, long-term neglect and continuous exposure to adverse conditions. Generally under planting is practiced where old palms are removed in stages over a period of three to four years. Peg marks the area to be under planted. Remove very poor yielder and those very close to the planting pits. The other trees are removed @ one-third each year during 2nd, 3rd and 4th year after planting. If the existing garden is irregularly spaced, remove old palms within 1 m radial distance in first year, 2 m distance in second year, 3 m distance in third year and the rest in fourth year. Generally flowering is delayed a little in under planted palms. – CPCRI.